Whether you're looking to celebrate a wedding, hold a conference or throw a private party, Don Mee is your dining destination. Don Mee has a large dining area that can accommodate 260 guests and a newly installed dance floor equipped with a sound and lighting system. A newly renovated bridal room is also available for wedding banquets and other special events. 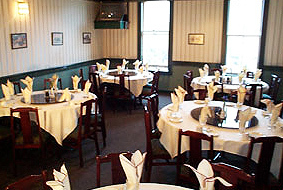 Our private room accommodates up to 50 people and can be set up in a variety of ways to accommodate a private party or tour groups. Equipped with a projection screen and wireless microphone, the private room can be set up for conferences and business meetings as well. Play host to a private party or business meeting in our VIP Room. Don Mee can accommodate your lunch or dinner function for 50 guests comfortably. Featured as The Heartbeat of Chinatown for over 80 years, Don Mee is also a popular stop for tour groups to experience a taste of Canadian history. Our private room, equipped with a projection screen and wireless microphone is suitable for holding conferences, meetings and presentations. The room seats 55 people comfortably. 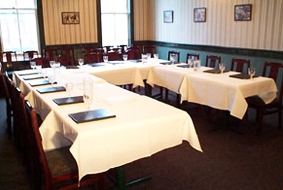 This private room seats 20 people comfortably for conferences, meetings and presentations in this set up. 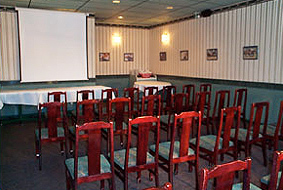 The space is equipped with a projection screen and wireless microphone to accommodate your business needs. We can help you customize a menu for your function or special occasion. Simply contact us and we will be glad to assist you in choosing or planning a menu just right for your event!